It turns out there’s a big difference. 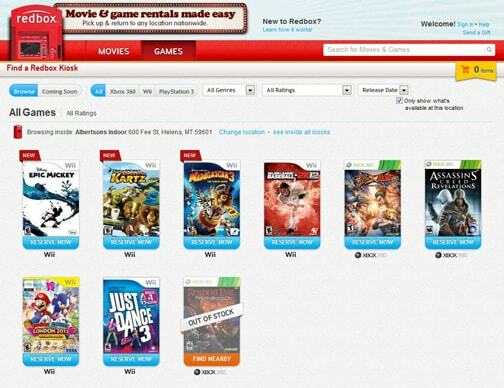 Redbox is a very convenient way to get the latest DVD, Blu-ray and video game releases. Whether you have a Wii, XBox, or just want to watch a good flick, you can stop by your nearest Redbox to see what’s available. There are Redbox kiosks in my local Walmart, grocery store, and drugstores, so pretty much I can grab or drop off the movie whenever I’m out running errands. I tried to pick up the video game at Walmart, however they were sold out. So I went online and reserved a copy of the game to pick-up at Albertson’s. I loved that I could reserve the game I wanted in advance, and I’ll be sure to reserve any future games or movies that I really want before heading out to pick it up. Dreamwork’s Super Star Kartz for Wii is incredibly fun. As in it’ll be hard for you to stop playing kind of fun. Admittedly, it was a little slow-going at first. I was repeatedly in last place until I started getting the hang of things. Eventually we all figured out how to do the bonus moves and use or power-ups to make all of the races even more exciting (and competitive.) 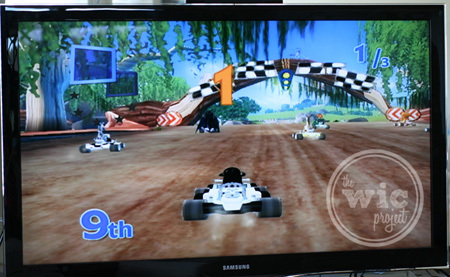 This was the first racing game I’ve played on the Wii and I loved how I could turn the controller like a steering wheel to make it more like car racing. When you’re playing a good game, you want to have some good snacks too. 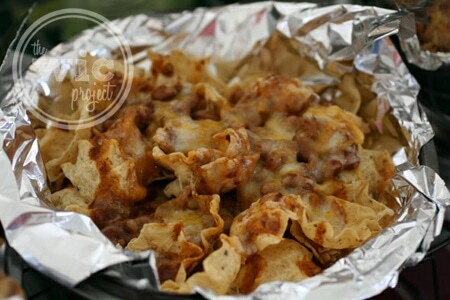 I decided to prepare some nachos for people to enjoy while we were racing. We had a few of the nacho ingredients already on-hand, such as the chili, but I head out to Walmart to grab the rest – tortilla chips, cheese, sour cream, and some cheese queso dip. First, I put the chips in an pan lined with foil and baked the tortilla chips only at 350 degrees for five minutes. At the same time, I heated up the chili on the stove. When the chips were done warming, I poured the chili onto the chips, then topped with lots of cheese. 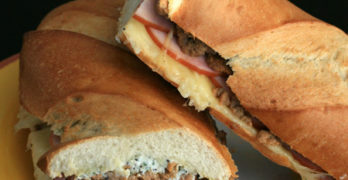 The pan went back into the oven for another 5-10 minutes – just long enough for the cheese to melt and get all gooey. The sour cream was served on the side since not everyone is a fan. Thanks to Redbox, we were able to easily (and affordably at just $2/night) try out a new game as part of our family fun night. Make sure you also follow Redbox on Twitter and on Facebook to stay up to date on their latest promotions – sometimes they even have free DVD codes! For other great games and their reviews, check out the Couch Critics review site at www.couchcritics.info. For a look at our shopping trip for DreamWork’s Super Star Kartz, you can view our photo album. I love, love, love redbox! They seem to have machines everywhere so it is easy to return movies and games. And they have a great selection. They are awesome and affordable! I love redbox. Especially when they send you a FREE dvd code. And your nachos look so yummy! I’ll have to try those sometime. I love Redbox, we use them all the time. I haven’t rented any games out of them, but we rent 2-3 movies every weekend and them return them when we’re done. I also love the fact that occasionally they’ll send out free codes via email and occasionally they’ll put codes on products like Totinos pizzas for free movies. 🙂 Love my Redbox. movies, games and food. What a great night. Redbox is the only one in my area like it. We love it. What a fun night! I love Redbox. I didn’t know you could reserve a copy online!! That makes me love them even more. Redbox is everywhere now. My family just rented a movie there for Father’s Day. We discussed that we need to take time as a family and play the Wii more. Simple family moments make great memories! I bet you had some laughs playing the game. I’ve been wanting to try out Redbox. There’s one right down the street at a gas station,so it would be a really convenient place to get movies. What a fun idea. 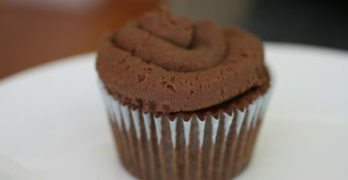 Love the recipe – they look so yummy! We got a wii on black friday but we only have Mario Kart (which is a blast). I’ve never rented a game before but I might have to try it. I have never used Redbox sounds convenient and easy to use I’ll have to see if there is one close by. We love Redbox. 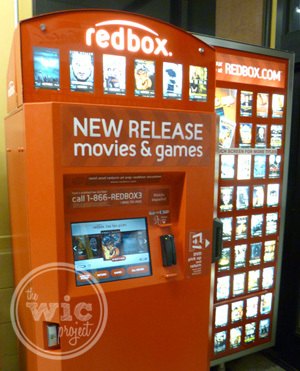 We reserve online and then pick up the movies at the Redbox inside our grocery store. 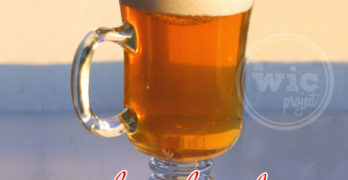 So easy, and a great price!